Recently I posted a Christmas Shopping List on Facebook that has done its best to go viral. As someone who shares a lot on social media I am often surprised by what captures attention and what does not. Nearly all of the content I post on Twitter, Facebook and LinkedIn, concerns the lives of people with profound disabilities of one form or another. The people who connect with me on those platforms care about those people. Conversations about how we create a more inclusive society are popular. A couple of weeks ago I posted a picture of a hair cut I had and was baffled by the number of reactions it got, only realising later that it wasn’t that the people connected with me cared particularly about hair, but that they cared for me as someone who campaigns relentlessly on behalf of their loved ones. I was quite humbled. You may know from my previous posts on SNJ that I run The Sensory Projects. The point of all of the various projects is to share the knowledge and creativity needed to turn inexpensive items into effective sensory tools for inclusion. What it means for me in real life is that I live onboard trains, travelling with a box of things that feel a bit interesting, or smell a bit interesting (and praying that some of the more interesting smells do not come open as I leap onto a train). All of my work focuses on improving the lives of people I have come to call Sensory Beings. I had to invent a term for some pragmatic reasons – the ever-increasing list of conditions my work related to was getting too big to fit into a tweet, and some philosophical reasons – the people I work on behalf of are brilliant, they are people I love, people I am willing to dedicate my life to, people I think are fantastic, and yet when I stood up to talk about them at conferences I was presenting them by their medical diagnosis. When I have a party at home I do not present my friends to one another by their medical diagnosis! So I was searching for a phrase that gathered them together in one group and celebrated their brilliance and for better or worse Sensory Beings was what I came up with. You are a Sensory Being if your primary experience of the world, and meaning within it, is sensory. You and I are Linguistic Beings: people who have acquired and use language to experience and frame meaning. One is not better than the other. They are just two different, but equally valid, experiences of life and when we work together to share our experiences we all benefit. I am not looking to convert anyone from one way of being to another but simply to share life, share experiences so that everyone benefits. [I was recently in the very privileged position of being able to share my ideas about the benefits inclusion holds for everyone on the TEDx stage with my Sensory Being co-presenter, Chloe]. 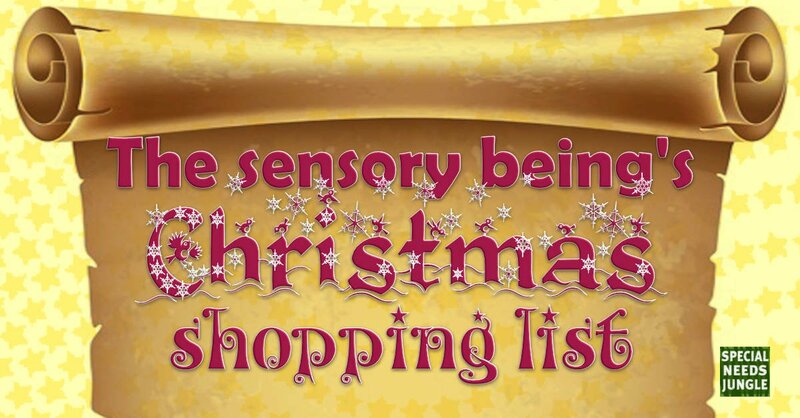 Each year at this time I hear from parents of Sensory Beings who are struggling to find them gifts for Christmas, I also hear from family friends and relatives who want to be able to get them a gift but don’t want it just to be tokenistic. People are happy to spend money but don’t want to spend it on something that brings no joy. What should they buy? Lip balm offers taste and smell experiences without the need to swallow. It is great for encouraging people to move their lips which in turn strengthens muscles used for breathing, swallowing and making sounds. Get a range of flavours. Hula hoop and shower curtain: Create your own mini sensory room by clipping a shower curtain to a hula hoop and hanging it from the ceiling. Inside you can play with toys that light up, or make sound, small immersive environments like this are great for getting increased responses or for hiding out from the Christmas chaos. A plain shower curtain is ideal but ones with scenes printed on them are also fun. These are great for encouraging vocalisations and are available for £1 on eBay, they light up in response to sound, play in a darkened room. So much fun for playing within the dark, black gloves with fingertips that light up and change colour, again you can pick them up for a few pounds on ebay. To make the room dark so you can play with all your fun light up toys. In a well-ventilated room melt small holes into ordinary 500ml drinks bottles. Fill the bottles with smells, e.g. a sprig from the Christmas tree, cloves, herbs, spices, flowers, potpourri, screw the lid on tight and offer one or two to play with at a time. You can buy a UV lightbulb that will screw into a standard light fitting for under £5, this will enable you to fluoresce a whole room in UV light. (Magic blackout, see above, can help to make the effect stronger). Once your room is glowing in UV light you can have all sorts of fun, try getting some rave face paint that fluoresces in UV and painting your faces, or dissolve a vitamin B50 tablet in water to make it glow and then play splashing and pouring. A Spinning Bubble: A metal spinning bubble will enchant any Sensory Being who enjoys visual stimulus. The company Bubbles Inc. sell them on their website. This app is available for free. It uses the camera on your I device to record your movements and turn them into sound. Point the camera at someone and their movements turn to sound. You can also draw and turn your drawings into sound. Sensory stories are a way to share a story through words, or through sensory experience or through both. I write them so I am very biased, but I think they are wonderful! You can buy one from me for £14 at The Sensory Projects, if giving it as a gift collect together a little box of resources to go with it. The Sensory Projects stories are all resourced with household items. Or you can buy a pre-resourced story from BagBooks, prices range from £30 to £100+. Better yet make up your own and resource it with wonderful experiences, the free to download guides on the website under the sensory story tab and the resources/guides tab will help you create and facilitate a fabulous sensory story. A membership to a local scrap store: If you have a scrap store near to you this gift is akin to giving your Sensory Being free toys all year. Scrap stores are repositories of sensory wonderfulness and members are allow to take as many resources as they like whenever they like! A vibrating toy: If you live near a Tiger shop they do a 3 pronged vibrating massager that costs about £4 and is by far and away the best vibrate toy I have found over the past 2 yrs. For Sensory Beings who tend to get anxious vibrations can be incredibly reassuring. For Sensory Beings who do not always engage through their other senses vibrations can be a way to reach them and delight them. Even an electronic toothbrush can be fun! Space blanket: A foil blanket, the sort that marathon runners get wrapped up in after they have finished a race. They cost about 50p and are wonderful, wonderful sensory fun, light, noise, shine a light on them, or sit near sunlight and they are dazzling! Store inside a fabulous box and help develop anticipation and excitement every time they are revealed.